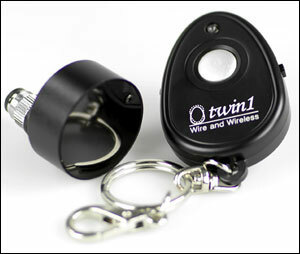 Zigview Twin1 Key Fob and plug in device. Zigview Twin1 setup with camera that does not have a built in IR sensor using the included Zigview camera plug in device. For compatible cameras with a built in IR sensor, the Twin1 remote key fob can trigger shutter directly by pointing the remote at the camera. For compatible cameras without a built in IR sensor but with a remote port, the Twin1 remote key fob can trigger the Twin1 camera plug in device which in turn trips the shutter. The plug device has a very sensitive receive with sensors on both sides allowing for trigger in front, back or sideways to the camera. 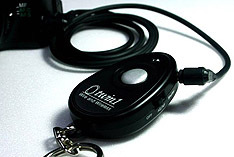 For compatible cameras without a built in IR sensor but with a remote trigger jack, the Twin1 remote key fob can trigger the camera by plugging in a supplied cable from the key fob to the camera. 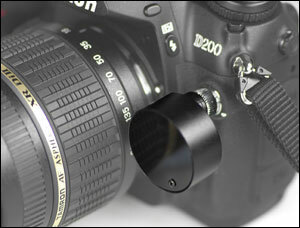 Seculine have released a range of wireless Infrared shutter triggers for cameras with or without built in IR facilities. The Twin-1 kits provide photographers with an economic and convenient way of triggering their cameras using the convenience of wireless control to give full flexibility both in the studio and outdoors. There are 2 models available, Twin-1 SRC and Twin-1 SRN. The Twin-1 SRN (Nikon) and SRC (Canon) kits include both the sender unit from the UT version and a receiver unit for users wishing to add an IR facility to their compatible cameras. The receiver module fits directly into the 10 pin socket (Nikon) or 3 pin socket (Canon) providing a complete system allowing infra Red triggering from both in front and behind the camera, with a maximum operating distance of up to 100ft. A cable is also provided with this unit to connect the sender and receiver for a wired shutter release.